D'or a trois pals de sable; au chef de gules, chargé d'un lion leoparde passant d'argent. he coat of arms used on this page is the "blazon" that I researched in 1973, in the genealogy section of the Bibliothèque Nationale, in Paris, as having been granted to an individual with the surname Marcotte from Normandy, or the Pas-de-Calais\Picardy region in the North of France. At the time, I was only looking for my French roots - not truly researching the Marcotte genealogy. I was elated to find a coat-of-arms, and did not even think to make a record of the source for this (I believed, however, that it was either Borel d'Hauterive's Armorial d'Artois et de Picardie (Généralité d'Amiens). Paris: Bureau de l'annuaire de la noblesse, published 1866,* or Armorial de la Généralité de Soissons: Picardie, both of which I have since confirmed do include references for the Marcotte surname, or The D'Hozier Armories, a 35-volume registry of French coats-of-arms, which I know to be located at the Bibliothèque Nationale in Paris). The same blazon is found for the surname Marcotte in Rietstap's Armorial General, Volume II, on page 153. I have since located a reference in the 1609 Armorial Général de France, by Charles Hozier that decsribes the armes of the Marcotte de Samette. These arms bear a smaller but exact copy of the blazon in question, in the first and fourth quarters of the shield (see the link just below). The Marcotte de Samette line issues from a Baudoin Marcotte, born in Artois, Pas de Calais around 1450-1475. As best I can tell, the first Marcotte designated as Sieur de Samette is one Loys (Louis) Marcotte, escuyer, who held several military and other titles during the mid to late 1500s. He died in 1598. * Having now obtained a copy of the relevant pages for the aforementioned Armorial (Armorial d'Artois et de Picardie, Generalite d'Amiens) I have now ascertained that there are four Marcotte blazons described in that work. Three of these - for a Nicolas, a Guillaume and a Paul Marcotte - are for a different Saint-Omer Marcotte line than the fourth (Anne-Francois de Marcotte de Samette). This Marcotte de Samette arms are simiar enough to the one in Rietstap that it provides a good reference for the specific line it derives from in Artois. The decription reads: "De sable, à trois billetes d'or, rangées en face, et un chef cousu de gueules, chargé d'un lion passant d'argent; écartelé, d'argent, à un créquier de gueules." The addition of the quarter section with the créquier (seven-branch "wild plum" heraldric device), and the similar but inversed colors and smaller billet" rectangles versus full "pales" seem to hint broadly that one of her ancestors bore the blazon that I used on this website. Antoinette was the great grand daughter of the aforementionned Loys (Louis) Marcotte de Samette. This simply coincides with the early evidence that the arms were for a Marcotte from the Artois\Picardy region. The earliest known ancestor for Anne-Francois de Marcotte de Samette is Baudoin Marcotte (b. about 1400-1450). So far, our Normandy branch has been connected only through the vagues Fécamp archive reference to Arthus Marcotte's father called simply "Le Marcot," who is described as having come to Fécamp from Picardie or the Pas de Calais region. This blazon, along with the aforementionned Marcotte de Samette arms and all the others that I have thus far located for various Marcotte branches may be viewed here. (Rietstap's description omits the word "passant," but all other sources mentioned here (including Rolland's illustration to Rietstap's Armorial) either show the lion-leopard as passant\guardant, or contain the word in the description). Prior to the late 14th century, any heraldic lion that was not "rampant" (standing) was referred to as a "lion leoparde." This was due to the general confusion at that epoch in armoury of leopards with lions. In the 15th century, however, leopards began to appear in coats of arms as an actual leopard, and thenceforth the term "lion léoparde" was uniformly used to indicate a lion that was at once "passant" and "guardant," i.e. - a walking\passing and watching (vigilant) lion. In is use in heralry, the lion leopard device is said to signify valor and vigilance in battle by the individual to whom the blazon was awarded. As mentioned, Rietstap's Armorial lists the above-depicted blazon for Marcotte as having originated in Artois, a region (and former province) located in Northern France along the English Channel, in the present department of Pas-de-Calais, between Picardy and Flanders. Owned in the Middle Ages by the Counts of Flanders, Artois was annexed (1180) to France by Philip II through marriage. Burgundy gained (in the 14th cent.) the territory, also through marriage. Likewise through marriage or inheritance, it came later under Austrian rule, and from 1493 until its conquest (1640) by Louis XIII it was under Spanish rule. The origin of the blazon in Flanders coincides with information from the ancient archives of Fécamp, Normandy, which also list the father of Arthus Marcotte as a man known only as "Le Marcot" who came to Fécamp from the Pas-de-Calais or Flanders. The name Le Marcot could also have been used in the sense of a man from Marcq (likely Marcq-en-Breuil, in Picardy, or or Marck in Pas-de-Calais). Although, no research has yet been uncovered to link the two families, there is one Marcotte line which traces back through St. Omer, the old capital of the Pas-de-Calais region, to a Baudoin Marcotte who would have been born sometime around 1400-1440. An earlier Marcotte, Willaume, is named in archives of Abbeville for a fief of the Provost of St. Ricquier, near present day Abbeville. In that reference, Willaume Marcotte is called to arms to aid the French against the English in the battle for Flanders during the 100 Years War (1338-1453). Again, despite the proximity of Abbeville to Marcq-en-Breuil, and Artois, locations associated with the blazon and the surname origin, no connection has yet been found from Willaume to the later Marcotte presence in Fécamp. A high quality frameable copy of the arms may obtained by clicking here. Then simply right-mouse-button-click, and "Save Picture As" to copy to your computer's hard drive or to a floppy disk. If you don't have a color printer, you should be able to take the disk to a copy shop that can print it in full color. 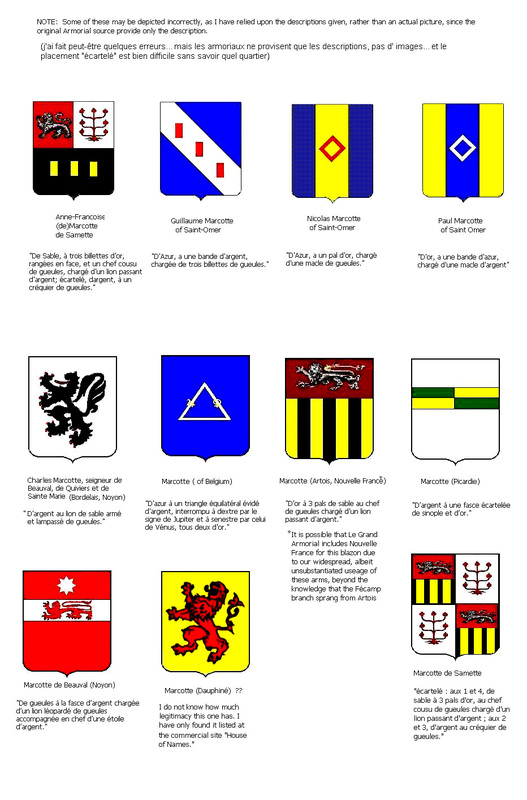 There are as many as eight other Marcotte coat of arms in various heraldric registries. This much was recorded by Father Jean Marcotte, who compiled the Genealogical Dictionary of the Marcotte Families, published posthumously in 1983. 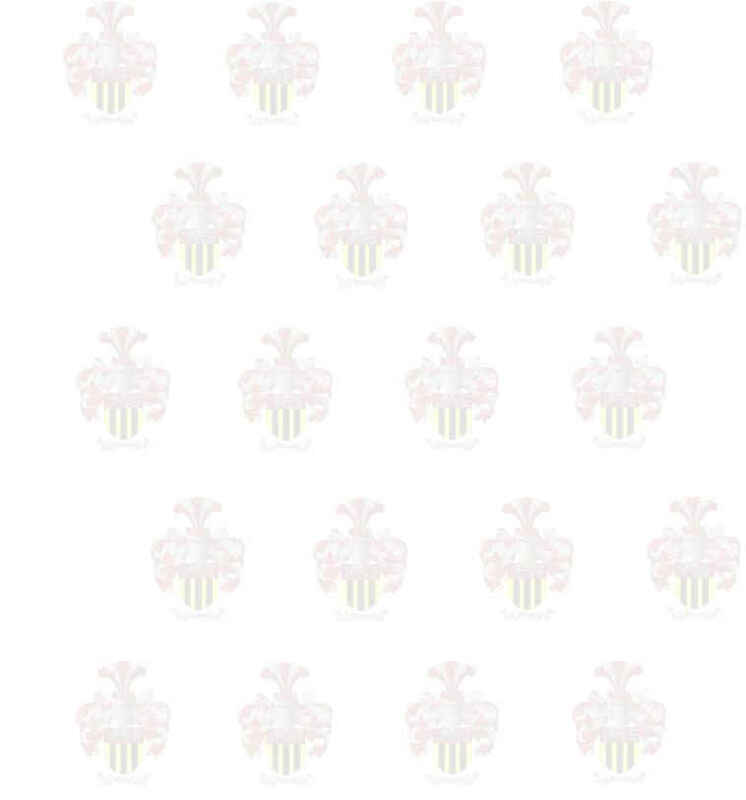 If you pay a company to research your coat of arms and tell them that your ancestors came from Normandy or from Artois, they will generally come back with the one above. My family has tested that. If you have VERY specific knowledge beyond what I have on these pages (I would like to know about it) then they MIGHT send a coat of arms showing a red shield with a silver lion-leopard rampant holding either a star or a crescent moon. Both the star and crescent are heraldric symbols indicating which birth position, i.e. - first son, second son. The "Marcot" spelling might also produce a different line altogether, showing a gold blazon with a red lion-leopard rampant. However, this coat of arms is associated with a Marcot family from Dauphin, and not the Marcottes from Normandy or the Pas-de-Calais. Likewise, there are two other Marcotte blazons I have found, one described as "d'azur a un triangle équilatéral évidé d'argent, interrompu a dextre par le signe de Jupiter et a senestre par celui de Vénus, tous deux d'or," but this blazon is attributed to a Marcotte family from Belgium. The other is for the Marcotte de Quivières family (from the Guyenne region) and is described: "d'argent au lion de sable, armé et lampassé de gueules." Father Jean Marcotte, the late Capuchin monk who was the leading genealogist for the Marcottes of Canada and the United States stated in his genealogical dictionary of the Marcotte family that descendants of Jacques and Nicolas Marcotte are not entitled to claim ANY coat of arms. Heraldric arms were assigned to nobility, and our traceable ancestors Jacques and Nicolas, and their father Charles were not nobility. In medieval society, only the 'fils cadet' - the eldest son would have inherited title and property. Younger sons were not entitled to the title or property, or even his father's coat of arms. Father Jean was, however, incorrect in his statement that coats of arms were only granted to nobility. Almost any heraldric source will validate that coats of arms were sometimes granted to landowners or even the merchant class of which Charles was a part. Nobility was designated by various types of coronets/crowns displayed above the shield portion of the coat of arms. The type of crown indicated whether the arms belonged to a Baron, Viscount, Duke, etc. No crown should be displayed above this Marcotte coat of arms. Additionally, new information since Father Jean's compilation has extended the Marcotte line back another two generations beyond Charles. The earliest Marcotte (...known to date) in our direct line has been identified was a simple gardener/horticulturist. Perhaps he was a direct descendant or a more distant relation of the Marcotte who bore the coat of arms. We'll probably never know. Father Jean did not find a coat of arms for a Marcotte from Normandy, but in 1973, with the assistance of the librarian in the armorial général at the Bibliotheque Nationale de Paris, I found the arms shown above, described as originating with a Marcotte from the region of Artois, which lies immediately adjacent to Normandie, and which was the area of Flanders/Pas-de-Calais from which the father of Arthus Marcotte is said to have come. It is of course possible, but UNLIKELY, that our ancestors were of NO relation to the Marcotte who bore this coat of arms. The first appearance of ANY recorded Marcotte in Normandy, was not until our line from Fécamp in the 1500s. It is fairly unusual to find records of a middle-class surname dating into the 1300s, and since the archives in Fécamp indicate an origin for Arthus' father from the same general region as the origin for this blazon, it is my firm belief that there must have been SOME relation. In modern times, if you would like to create a coat of arms and have it registered for your family, this is possible. Nobility no longer has a monopoly on heraldry. Whether I or you may TECHNICALLY claim this coat of arms IS A MOOT POINT in today's society. We are not nobilty - who cares? We still have roots, and these have been unquestionably researched to the 1500s in Fécamp, Normandy, with unspecific earlier origins referred to in archives at Fécamp indicating the adjacent Pas-de-Calais and/or Picardie. If your ancestors are in these charts,you have more claim to this coat of arms than most people who display one that matches their name. I display the above arms, proudly, in remembrance of my Norman roots, and the 14 generations of Marcottes from whom I am descended. In the words of the Québecois motto, "Je me souviens." 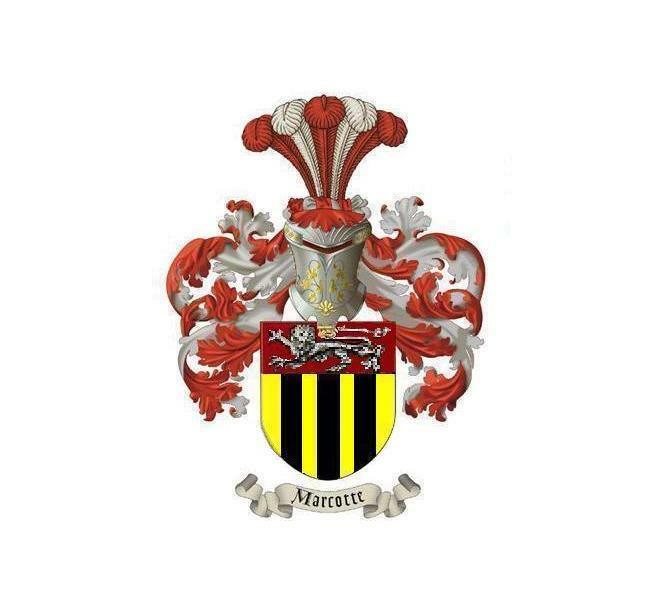 For anyone who does not feel that using the above coat of arms is appropriate, I have designed one of my own, registered it, and linked it here. Anyone who wished to use it may do so with my blessing. In the current day and age, anyone may register and use a coat of arms, so I created this one, which draws heavily on symbolism from our ancestry and related coat of arms. The Association of Marcotte Families (Association des Familles Marcotte), based in Quebéc Province, has subsequently also designed its own Marcotte Association coat of arms, elements of which draw from the Normandy lion rampant, fleur-de-lis, and marcotte-crequier sections, which I had offered as suggestions when I submitted my own design for their consideration.